See further down this page at (8). The present issue of Practical Welding Letter, the 160th, closes the current year 2016 with a diffused uneasiness regarding what the near future will bring about. An Article (2) is reported summarizing studies that were done by performing laser welding in vacuum, hoping to limit porosity in welds: this may work somewhat, but the striking differences versus welding performed at normal pressure are weld penetration and shape, that become similar to those done by EBW (Electron Beam Welding). Is it worthy using vacuum for lasers? It remains an open question, to be decided in any specific case. Another aspect of laser welding regards controlling its characteristics, in particular the power density of the laser beam, as it is a critical factor in the success of laser welding. A reported note (3) by a world renowned expert sheds light on the process and instructs on how to control it. The next question (4) is how to control porosity when GMA welding superduplex stainless steel. This time the answer is vague, because nitrogen in the base and filler metal seems to react with the shielding gas mixture, especially if it contains oxygen, considered beneficial for wetting and bead shape when welding duplex and super duplex stainless steels. More data must be collected to improve understanding. Raising a half sunken cruise ship to allow towing it to a dock for dismantling is described (7) as one of the largest engineering feats in marine history. Welding obviously played an important part in the exercise. Welding of thermoplastics is not often discussed in these pages. This time a major project is reported (11) that required developing and qualifying welding procedures for a long plastic pipeline with demanding performance requirements. It should not be a surprise that procedures used normally for other materials find modified applications for unusual materials. Refractory Metals (8) is the subject of our recent Mid Month Bulletin, written for those of our readers who accept our invitation to build their own Metals Encyclopedia as a useful reference, ready whenever needed. The remaining columns can be found at their usual place. Your feedback is welcome: send it using the Contact Us Form. At first sight, it might seem a mistake. Indeed we were told that the main difference between Electron Beam Welding and Laser Beam Welding is Vacuum. Both are known as High Energy processes whose concentrated power can be pinpointed with precision from a distance, to reach line of sight targets well removed from the source. But while EBW needs a vacuum chamber to be performed effectively, with all the complications implied, for the chamber (floor space), the complex vacuum system (various sets of low and high vacuum pumps), energy spent and (waiting) time needed just for evacuating the space, LBW needs nothing of all that, being ready for use with only a thin atmosphere of inert gas around the fusion zone. It is still all true but, as shows a recent article published in the November 2016 issue of the Welding Journal at page 419-s, there are a few advantages by going vacuum also with LBW. Briefly, by Laser Beam welding in vacuum, one gets increased up to four-fold keyhole penetration and reduced weld width, similar to EBW. Additionally, porosity is reduced as shown hereafter. The research compared results for laser welding Titanium and Nickel, both with Argon shield at atmospheric pressure and in vacuum at 10-1 mBar. Moderate to severe porosity was observed under Argon in normal atmospheric pressure welding conditions in steels and austenitic stainless steels. However under nitrogen instead of argon, laser welds contain little or no porosity under the same conditions. For nickel this does not work because high porosity levels are reported for laser welding in argon or nitrogen. Laser under vacuum essentially eliminates porosity in titanium and significantly reduces, but not completely, porosity in nickel. Titanium cannot be welded in nitrogen because of its reactivity. This brings back the need to find solutions to porosity for laser welding titanium or nickel. Vacuum or reduced pressure has been investigated in the reported article. In particular three-dimensional computed tomography was found an important tool for understanding porosity distributions. Porosity was significantly reduced by performing laser welding in vacuum. Weld pool shape and penetration were remarkably affected, becoming quite similar to those obtained in EBW. Readers struggling with unacceptable porosity in laser welding of nickel or titanium are urged to seek the original reported article to study the influence of vacuum on the outcome. 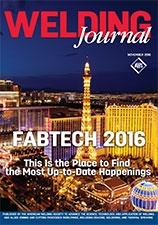 Readers that use lasers for welding should be informed that the Welding Journal recently initiated (September 2016) a periodic Laser Welding Q&A Column. In the last November issue at page 24, answering a query from a bothered inquirer, the Author introduces the need to know the power density of the laser beam on the material's surface. The importance of knowing the power density of the focused laser beam is emphasized because practical experience indicates that in more than 90% of the cases, weld defects are directly related to incorrect power density value and laser beam quality. The remaining weld defects, according to the columnist, originate from the weld geometry, shielding gas (composition and delivery), metallurgical composition of the metals, etc. Asked on how to ascertain power density, The Author explains that there are no commercially available instruments capable to measure directly and safely the power density of the focused beam. Instead, the power density should be assessed by measuring separately a few laser beam characteristics that allow its indirect computation. He also notes that it is more important to know the power density of the laser beam on the material's surface rather than at the focal point. The author makes direct reference to Paragraph 8 of AWS C7.4/C7.4M:2008, Process Specification and Operator Qualification for Laser Beam Welding. The Author advises that the laser beam metrology package for the yearly Calibration traceable to the National Institute of Standards (NIST) costs approximately $25,000 to $45,000. For daily partial Qualification at reduced accuracy the cost of this quality entry-level laser beam metrology package is likely under $3000. The column closes with an example of the computations required. Interested readers should seek the original article and become familiar with the author's name, SIMON L. ENGEL, whose affiliations and contacts are reported there. The regular column on Stainless Q&A by Damian J. Kotecki published in the November 2016 issue of the Welding Journal at page 28 leaves readers wondering. This is one of the very rare cases where a definite answer is not given, because the cause of porosity occurring when GMA welding of superduplex stainless steels (S32750 or S32760) with filler metal ER2594 is not clearly known. Base and filler metals contain a minimal amount of Nitrogen. The author refers to a recent study performed on these materials with different mixtures of shielding gases. The gases used where Argon with 30% Helium with minimal additions of an oxidizing gas such as O2, CO2 or NO. The additions are thought to improve wetting. From the study appeared that the elimination or reduction of oxygen would reduce porosity but no clear indication could be concluded. The author invites feedback from fabricators with experience of low oxygen potential to prevent or limit porosity. Readers with relevant experience are urged to provide their input. Arc Length is the distance between welding electrode tip and adjacent surface of the weld pool. Backfire is the momentary recession of the flame into the welding tip or cutting tip, followed by immediate reappearance or complete extinction of the flame. Capillary Action is the force by which liquid, in contact with a solid, is distributed between closely fitted faying surfaces of the joint to be brazed or soldered. Defect is a rejectable discontinuity because the part or product is unable to meet minimum applicable standards or specifications. Edge Effect in thermal spraying is the loosening of the bond between the thermal spray deposit and the substrate at the edge of the thermal spray deposit. Face Reinforcement is the weld reinforcement at the side of the joint from which welding was done. Gap is a nonstandard term for arc length, joint clearance and root opening. Hammering, in resistance spot welding, is excessive electrode impact on the surface of the workpiece at the start of the welding cycle. 7 - Article: Raising a half sunken ship. One of the largest engineering feats in marine history is described in an article published at page 34 in the November 2016 issue of the Welding Journal. It concerns the raising of the shipwrecked Costa Concordia that, after the accident occurred on January 13, 2012 off the coast of Isola del Giglio in Italy, had settled eventually on its starboard side in shallow waters, with half the boat still submerged. It had to be made floating again to allow towing it to a dock to be dismantled to avoid a larger environmental disaster. The project involved several steps, many of which had not been attempted before. The hull was first secured to land with steel cables, to prevent it from slipping in deeper waters. Then a submerged horizontal platform was built to hold the ship once raised. The ship was pulled into upright position using winches attached to the platform. Then watertight tanks, called sponsons, were attached to both sides and emptied of water to raise the ship by buoyancy so it could be towed away. The sponsons had to be joined together to form a floating chamber. The article, after explaining how a small abrasive tool was used to remove excess weld to permit joining the sponsons to each other, goes on to describe other important maintenance and fabrication uses of the implement. The note sounds like an advertisement, but it may be the right tool for certain types of grinding work. Interested readers curious of the details, are urged to seek the original article, that includes also a link to the author. The Page of this Month is the last one, for the time being, for the series intended to permit to intereted readers to build up their own Online Encyclopedia, using freely downloadable information from the web. By preparing patiently within one's computer several organized searchable folders full of reliable knowledge from trusted sources, one prepares a personal Manual or Handbook dedicated to those items most likely to be needed in one's field of interests. This is explained in our page on Metals Knowledge. The last contribution to this effort is Part 9, dedicated to resources on Refractory Metals, available online at Bulletin 124. It is hoped that readers will enjoy this opportunity, collecting the most significant pages for their own perusal whenever necessary. Comments and feedback are always welcome. Please use the Contact Us Form. 9.1 - Gage Length is the original length of that portion of the specimen over which strain, change of length and other characteristics are measured. 9.2 - Half Hard is a temper designation of nonferrous alloys and some ferrous alloys characterized by tensile strength about midway between those of dead soft and full hard tempers. 9.3 - Induction Hardening is a surface-hardening process in which only the surface layer of a suitable ferrous workpiece is heated by electromagnetic induction to above the upper critical temperature and immediately quenched. 9.4 - Joint is the location where two or more members are to be or have been fastened together mechanically or by welding, brazing, soldering, or adhesive bonding. 9.5 - Keyhole is a welding technique in which a concentrated heat source, such as a plasma arc, penetrates completely through a workpiece forming a hole at the leading edge of the molten weld metal. As the heat source progresses, the molten metal fills in behind the hole to form the weld bead. 9.6 - Laser is a device that produces a concentrated coherent light beam by stimulating electronic or molecular transitions to lower energy levels. Laser is an acronym for light amplification by stimulated emission of radiation. To many of us, familiar with metal welding, the notion that welding procedures need to be qualified for welding a long thermoplastic pipeline, may result new and intriguing. In fact one may think of welding thermoplastics only for small unimportant and unstressed objects. However, an article published on page 51 in the November 2016 issue of the Welding Journal describes a real project where a seawater intake pipeline 600-m (1998-ft) long was constructed that consisted of a 355-mm (14-in.) outer diameter (OD) and wall thickness of 27 mm (1.06 in. ), high-density polyethylene (HDPE). This is obviously a major welding project, despite what one may think of it. High-density polyethylene is considered to be the most appropriate material for seawater applications because it is resistant to corrosion and UV radiation. In addition, it is light in weight, highly flexible, and has good strength to withstand erection loads. Like any other engineering project, to guarantee the severe working conditions and satisfy design requirements, the welding procedures have to be developed and all parameters optimized before they can be qualified by submitting test samples to visual and destructive tests. The equipment aligns and holds the tube ends to be joined, a motorized facing tool is used for trimming the pipe faces, and a heating mirror heats the pipe faces. The heating unit consists of a circular metallic electric heater to heat both faces simultaneously by direct contact, through a temperature controller. The article describes the procedure in detail including facing, inspection, contact heating under pressure of both ends against the heating mirror. After the required time at pressure, which forms visible beads, the system is depressurized, the pipes moved apart, the heating mirror is removed and the abutting surfaces are quickly inspected and again pressed against each other. Then a thorough visual inspection follows to detect misalignment and defects. The whole line was hydrotested, was found without leaks, cracks or unacceptable deformation and was cleared for installation. Through the description one learns that the process is quite complex, that it requires knowledge and experience, and discipline in applying correctly all the steps, taking care to use the approved parameters. The article makes clear to all readers that a job like the one described is a real challenge that must be performed with humility and confidence but with the utmost attention to the slightest details. I have been receiving your Practical Welding Letter for some time now and I always find it interesting. I worked for Sciaky UK for 55 years, retiring at age 81 (now 87) so my interest is primarily resistance welding but I am interested in all metal joining techniques. You help me keep up to date with new technologies and processes, great stuff. I still do some work for the old firm to keep my hand in. Long may it continue. Just wanted to thank you for very helpful comments. Nonetheless I can see more potential after your suggestions. Despite my prominent warning NOT to use Reply for sending me a question, I got back in full my last issue of PWL, with a short question of somebody. The inquirer did not enclose his own e-mail address. Therefore I was unable to send him any answer whatsoever. Dec. 7–9. Pasadena Convention Center, Pasadena, Calif.